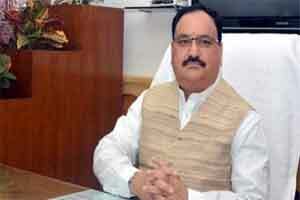 While noting that donating organs is a gift of life and is an altruistic, egalitarian and essentially moral act, Shri J P Nadda, Union Minister of Health and Family Welfare urged people to come forward and donate organs to save lives. He stated that this noble act can ameliorate the suffering of all those needy patients who need our support. He was speaking at a function on the occasion of 6th Indian Organ Donation Day organized by National Organ and Tissue Transplant Organization (NOTTO), Directorate General of Health Services, Ministry of Health and Family Welfare, here today. Shri C Vijaya Baskar, Health Minister of Tamil Nadu was also present. The Health Minister also launched the nationwide registry of National Organ and Tissue Transplant Organization at www.notto.nic.in which meets the demand-supply gap between those who require transplantation and those who can meet this requirement. While earlier only kidney donors were included in this registry, now it caters to demand for kidney, liver and heart transplantation also. Expressed concern over gap between demand and supply of donated organs in the country despite the various activities to promote organ donation, the Health Minister said it is necessary to involve society, NGOs, voluntary organization, religious leaders in this movement to encourage people to donate their organs. He informed that the current organ donation and transplantation system is nowhere close to the requirements for organs in the country. Against a requirement of 1 to 2 Lakh kidneys, only about 5000 transplantations are being done annually. Similarly against a requirement of 30000 Liver transplantation requirements, we are currently doing about 1000 only. The main reason for this is very less number of organ donations from amongst deceased, he added. The demand for organs for transplantation, on the other hand, continues to increase and will increase manifold in future keeping in view the increased incidence of lifestyle diseases. So, there is a need for devising a system for improving the rate of safe, effective and ethical donation of cadaver organs for transplantation in those who need them badly, he said. In view of above fact, Shri Nadda proposed a three pronged road map for action which can further improve the organ donation system in terms of Infrastructure, Education and Training and Awareness strategy. Elaborating his ideas, he said that at present all transplant facilities are available in Metropolitan cities and 95% are in private sector. There is a need to increase the transplant facilities in other parts of the country. The Ministry will work to create a transplant facility in every medical college in the country in a phased manner. Further, the Health Minister said that training in this regard can be imparted in leading transplant centres of the country such as AIIMS, PGI, SGPGI, Nizam Institute of Medical Sciences and leading transplant centres in private sector. This will result in increasing trained manpower and infrastructure for organ donation and transplantation and help in bridging the gap between requirement and availability of human organs for transplantation, he added. The Health Minister also suggested that organ and tissue donation should be included in the syllabus of Under Graduates (MBBS), Post Graduate (MS & MD) and Under Graduate and Post Graduate Nursing Degrees. Awareness Strategy for general public needs to be developed keeping in view socio-psycho-cultural belief of society, he said. The Health Minister informed that the Government of India is implementing National Organ Transplant Programme with a view to promote organ donation from deceased persons and thereby increase the availability of organs for transplantation. The Health Ministry will also felicitate states where good work is done, families who help in mobilizing organ donation and organizing competitions and activities to promote organ donation, the Minister added. Further he said, other activities being planned include publicity through print and audio-visual media, SMS, talks by experts, etc. Shri C Vijaya Baskar, Health Minister of Tamil Nadu who received the best state award in the area of cadaver organ donation, said that the state government has taken decisive steps to promote organ donation and transplantation, created patient-centric healthcare and green corridors to facilitate organ transfer and donation for the needy persons. He also said that the state government has doubled its health budget for year 2015-16. Speaking on the occasion, Shri B P Sharma, Secretary (Health and Family Welfare) congratulated families of organ donors and stated that there is need to encourage organ donation. He said states, where there is no transplant facility, should establish such centres so that needy people can benefit. Dr. (Prof) Jagdish Prasad, DGHS said that there is a need to sensitize people to come forward to donate organs. This needs to be supplemented through creation of infrastructure, helps from community and religious leaders and administrative systems that make this possible. Shri Nadda also felicitated organ donors’ families these included Mrs. Anita Mantri, Mrs. Sunita Rashmi Shah and Shri Prashant Jain from Mumbai, Sh. Sanjay Gandhi from Chandigarh, Smt. Kasmir Kaur from Punjab, Sh. Roop Singh and Shri Kuldeep Singh from Himachal Pradesh, Shri Dinesh Kumar from Haryana, Shri Vinod Kumar from Delhi, Shri Bijoy from Kerala, Fr. George Kannamplakkal (Incharge of the orphanage as the donor was an orphan) from Kerala, Shri M Ravi and Smt. Rajlakshmi from Tamil Nadu, Shri Suraj Sahu and Shri Shyam Singh Rawat from Uttar Pradesh. He also felicitated the award winners of national competition on slogan writing to promote organ donation. Shri Niraj Sharma from Gujarat got first prize in competitions on slogan writing while Shri Niraj Choudhary from Delhi and Shri Ashwini Chaudhary from Haryana got second and third prize respectively. Smt. Uma Shukla, Ms. Sangeeta and MF Jaipur Citizen Forum (MFJCF) were also awarded for the slogan writing. The Health Minister also congratulated and honored the state government of Tamil Nadu for their endeavor in the area of organ donation. The National Organ and Tissue Transplant Registry have two components; one is for organ and other is for the tissues. These two components are for the professional and administrative bodies, which can be accessed by networking Organizations. Other components are for public information. It has information about the various hospitals who are doing transplantation people who have pledged for organ donation, the patients of organ failure waiting for transplants, living donor who are donated the organs, information on the follow up of living donor and transplant recipients. The networking has been started through this registry in Delhi and NCR Hospitals. This will be soon be extended to the rest of the country. The purpose of the registry is also for providing all information about Organ donation and transplantations to all stake holders, sharing and allocation of organs in a transparent manner and monitoring trends, audit and outcomes of transplants which will help in improving the practices and policies in relation to organ donation and transplantation. It will also help to scientific and professional bodies for future research. Also present on this occasion were, Shri C K Mishra, (AS&MD), Shri Navreet Singh Kang, AS (CGHS/NACO), Shri K B Aggarwal, AS (Food and Drugs), Shri Saudan Singh, Director, NOTTO and other senior officers of the Health Ministry.